We never thought it would actually, but after a two-year campaign, Kim Kardashian has brought bike shorts back. They're not even just 'in'; bike shorts are normal again. We laughed when Kim Kardashian was first pictured wearing the most unflattering of shorts in 2017. But then Bella Hadid wore them. And Kim's sister Kendall. And Katy Perry, and Emily Ratajowski. Bike shorts - or cycling shorts, if you remember them from the mid-nineties - have made it. One might call them the Donald Trump of the style world. No one thought it would really happen, but it turns out people had a secret liking for them. That, or they were subliminally influenced. Like them or not, bike shorts are now so mainstream, they're appearing on shop's web pages without a hint of irony. They're just...there. They come in all colours and prices. They're styled the new celeb way, either with heels or chunky trainers. 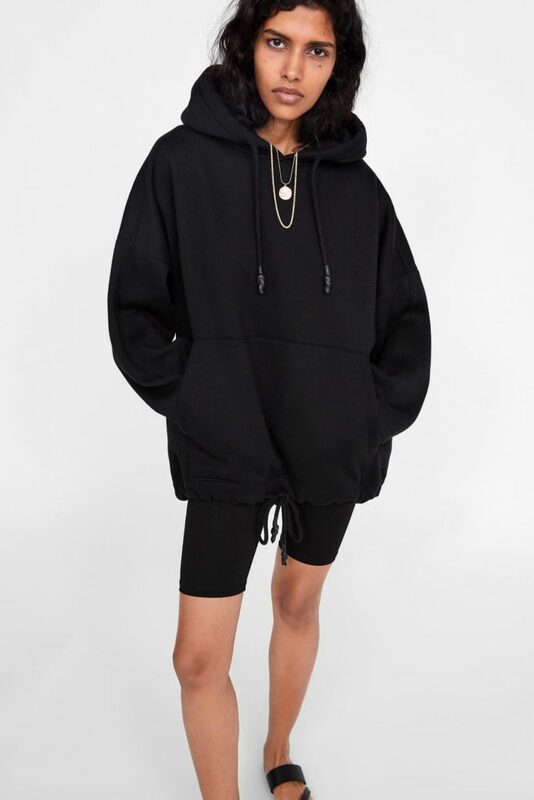 Models wear them in the sporty style, with oversized hoodies, or in the lounge style, with big comfy knits. But they also wear them with blazers and blouses, for, well, going to work in? Or out in? You can wear yours in the style of Sarah Jessica Parker in LA Story, the California way, with crop top and roller blades. Zara has about ten million to choose from, all with different names (cycling leggings, Bermuda shorts). You won't be hard-pressed to find a pair anyway. That is if you want a pair. Celebs and models can wear them without abandon, but are they really suitable for the average gal about town? Let us know in the comments.